The quality of a product is no longer enough to capture the fickle attention of consumers. Industry needs to find out precisely what consumers want and provide it. With an increasing number of sectors realising this, the market research and analytics, or R&A, space is suddenly witnessing sizeable growth. A company's R&A can either be handled in-house or outsourced, but spending on it has increased substantially. 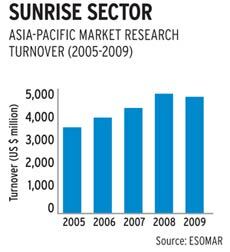 According to a 2009 report, the last such available, by ESOMAR, a global association of market researchers, the Indian market research industry is worth $192 million, or Rs 864 crore. Sudeshna Datta, Co-founder of AbsolutData Research & Analytics, a R&A service provider, says companies overseas now spend around $10 to 20 million each on market research. "Most of our business comes from the West. The knowledge process outsourcing, or KPO, space is really flourishing," she says. Companies are increasingly focused on more effective ways of delivering services and are looking at offshore outsourcing as a viable option. Even Indian businesses have begun doing so, she adds. Datta says R&A in the KPO space has grown by 25 to 30 per cent and companies are doubling their spends every year. "This is clearly visible from our own business growth. We now have offices in the US and the UK. In Delhi, we opened our office only last year," she says. A number of small and mid-size research firms have started in India and more and more people are joining them. Says Purvi Sheth, CEO of Shilputsi, a human resources consulting firm: "This can make for a very interesting career. There aren't enough experienced workers as people rarely want to pursue this as a long-term goal," says Sheth. Given its flexible nature, the sector also attracts many temporary workers, for whom it is a good training ground. "Temporary workers comprise 15 per cent of our staff. If they are good, we hire them permanently," says Datta. A stint in R&A with dominant players such as McKinsey Knowledge Center, Genpact, Fractal, Nielsen and Taylor Nelson Sofres adds value to a professional's work profile. "This is one sector where you have to deal with all industries - from soap to automobiles," says Raj Sharma, President and Co-founder of Majestic MRSS, a market research company. "You are exposed to various facets of every industry, so shifting to any other sector becomes easy. Most people will favour a person with such experience." Since the field is still evolving, the salary range varies. Entry-level salaries, says Sharma, are around Rs 84,000 to Rs 1.8 lakh per annum, while Sheth pegs them at Rs 3 to 4 lakh. Datta says mid-level employees earn around Rs 12 to 16 lakh a year, while those at senior levels get between Rs 25 to 30 lakh. What sort of qualifications are needed to enter? These are flexible, depending on the type of research to be carried out. But a curious and detail-oriented mind is a must.